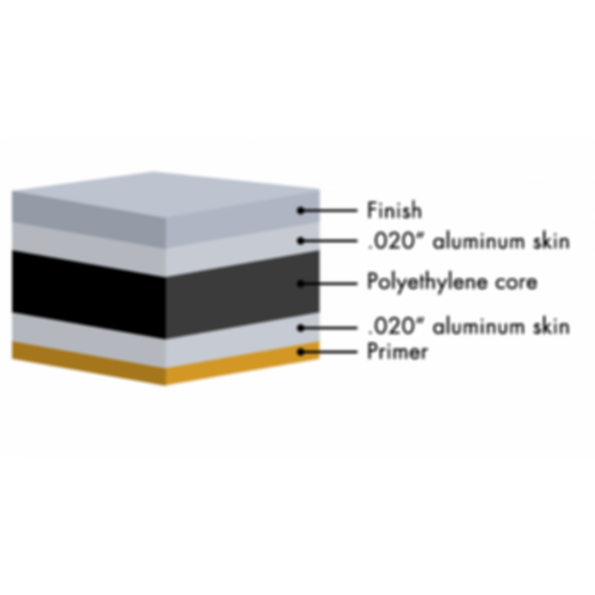 ALPOLIC®/PE is an aluminum composite panel that is produced by laminating two thin panels of aluminum on either side of an extruded core of thermoplastic polyethylene material. These panels are offered in a wide variety of finishes and colors, featuring our advanced Lumiflon® FEVE resin in Valflon® coatings supplied by Valspar. We also offer a core of thermoplastic polyethylene material in our HD heavy-duty aluminum composite panel, RF reflective aluminum composite panel and a selection of natural metal composite panels. ALPOLIC®/PE offers the rigidity of heavy-gauge sheet metal in a lightweight panel that's easy to fabricate and adaptable to a vast range of indoor and outdoor building applications. Our materials look better and last longer than competing composite panels or solid metal, delivering superior flatness, vibration damping, durability and ease of maintenance. They also offer far more choice - so you can get composite panels with the perfect finish, color and design at a very competitive price. Stock ALPOLIC®/PE panels are available in various sizes and thicknesses beyond industry standard widths such as 50" and 62" and lengths of 146" and 196". Please contact Customer Service for most current availability. Additionally, custom lengths and thickness are also available. A wide range of colors are stocked for immediate delivery, with unlimited possibilities for custom color matching. We also offer metallic, mica, prismatic and multi-color finishes; stone and timber effects; decorative metal finishes; natural metals; and anodized aluminum. ALPOLIC® is proud to be a global leader in aluminum and metal composite manufacturing. Our premium products have inspired new aesthetics and enabled new design possibilities for decades. Our commitment to quality, sustainability and customer care is unmatched. With more than forty years in the business, we know excellence. ALPOLIC® materials stand out and demand to be noticed in any setting.